Darren Murray has made a shock return to Portadown on a two-year deal in the immediate aftermath of his release by Crusaders. The prolific forward had his January switch to the newly-crowned Danske Bank Premiership champions end under a cloud following failure to appear for a fixture. Darren Murray has signed for Portadown on a two-year deal. Now he is hoping a second spell at Shamrock Park by combining two positive periods from his past can secure a bright future. Murray also left the Ports under difficult circumstances by forcing a move to Cliftonville with a submitted transfer request. 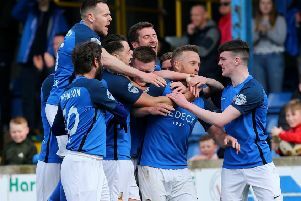 However, the 26-year-old is determined to move forward from a series of disappointments and fire Portadown out of the Bluefin Sport Championship thanks to a special relationship with manager Matthew Tipton. Tipton signed Murray for Warrenpoint Town last season and the forward feels Portadown will provide the perfect home. “I know I’m my own worst enemy and in the past I have often made mistakes or followed bad advice,” said Murray. “But I’ve recently become a father and want to find that stability on and off the pitch. “I’m just trying to get back on track, enjoy my football and score goals. “I just want people to judge me for what I do on the football pitch. “When I look back I think of Portadown as the club I probably enjoyed my best times with overall and have a great connection with Matthew and his coaching staff. “I only wanted to play under Matthew and am looking forward to firing Portadown back up to the place the club deserves to be. “I’ve always scored goals and want to score important goals now for this club. “Matthew has looked after me since I joined Warrenpoint and I always remember how the stands at Portadown would be packed when I first joined. “It was sad to see the club go in the wrong direction but you can see the support has been excellent and it is exciting to hear Matthew’s plans and the players he is hoping to sign. Portadown director Peter Hunniford has expressed his thanks to Crusaders. “Given Matthew and Darren’s personal friendship they always kept in touch,” said Hunniford. “I made contact with Crusaders late on Friday night and we reached an agreement for Portadown to sign Darren following his release by Crusaders.